Is your home prepared for a fire emergency? We’ve all heard that sound before. It can be loud, alarming, and startling, all at the same time. In fact, many people seem to get very discombobulated as soon as they hear a fire alarm. However, there are important things that you can do in the event a fire alarm has sounded to help protect you and your entire family. Here is everything you need to know in the event that a fire alarm is going off in your home. There is always a reason behind a fire alarm noise. In fact, oftentimes the reason is simply that there is a lot of cooking going on in the kitchen and there is no ventilation. That can be dangerous. It’s important to always just assume that any fire alarm is a real thing. Fire alarm systems, as well as smoke detectors, are very sensitive and highly effective. Yes, there are the rare false fire alarms that do manage to go off, but the keyword is that they are rare and seldom happen in a home. Your home might be expansive or it might be on the smaller side. No matter where you happen to be in your home, it’s critical that you stay vigilant and on top of things whenever you hear the fire alarm going off. In fact, avoid the desire to panic. Instead, choose to stay calm and know that evacuation is always the best policy when it comes to a fire alarm signal. As always, it’s important to always practice proper fire safety protocols and measures. 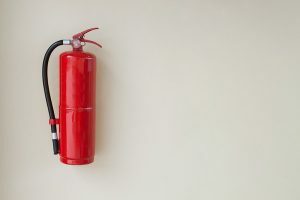 In fact, being mindful of all the procedures that must be taken when you hear a fire alarm go off will make everything go smoothly in the event that a fire does break out. This entry was posted on Friday, September 14th, 2018 at 2:53 pm. Both comments and pings are currently closed.